As professional Bailiffs, Civil Enforcement Agents and Debt Collectors we have to have a clear understanding of the relevant legislation and industry best practice so as to provide you with an effective and good value service. There have been significant changes to the law recently with regard to the work of Bailiffs / Civil Enforcement Agents. Plus we are expecting major changes to the licensing of Private Investigators. We will be sharing with you information on those changes. Quality Bailiffs (trading name of Enforcement Bailiffs Ltd) have achieved ISO 9001 certification as part of an ongoing commitment by the company’s management to providing the highest customer satisfaction experience. Quality Bailiffs (trading name of Enforcement Bailiffs Ltd) awarded accreditation under The Contractors Health and Safety Assessment Scheme, recognising our Health and Safety standards. We are pleased to announce that we have a new member of our teaching team. Daren Shaw, former pupil of our Enforcement Agent Training Programme, has become the newest member of our training team. IES is a division of Enforcement Bailiffs Ltd.
Enforcement Bailiffs CEO Andy Coates is the new President of the Certificated Enforcement Agents Association, CEAA. A version of the Ransom Virus is back! In this post we aim to tell you a bit about the nature of this nasty computer virus and how it’s even affecting us here at Enforcement Bailiffs. The last major business event for us in 2016 took place on 23rd December 2016. We were pleased and honoured to have been proposed and then awarded the title of Leading Enforcement Advisor of the Year by Acquisition International Awards. Recently we seem to have had a run of trespassing travellers invading town and city car parks to operate a parking charge scam. After disabling the car park pay machine they take cash from the car drivers to park. Most people have never used a Bailiff or Enforcement Agent, as we are now called. You may not be sure which type of bailiff you need - there is more than one type of bailiff. 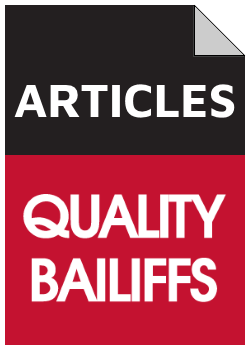 In this article we cover when you might need a bailiff, and which type you need. When do you Take Control of Goods? We are nearly two years since the implementation of the Tribunals Courts and Enforcement Act 2007 and The Taking Control of Goods Regulations 2013, which came into effect 6th April 2014. Despite Enforcement Agents needing to hold a Level 2 qualification there are still some getting Taking Control of Goods wrong. Read When do you Take Control of Goods? Who should Value goods Taken Control of? Who should value goods seized by the enforcement agent to be sold to pay the outstanding debt? Certificated Enforcement Agents should seek an independent expert valuation when goods are believed to be of high value. If they fail to do so they are being negligent in their duty. Read Who should Value goods Taken Control of? An Enforcement Agent (Bailiff) has a duty to take control of the goods that belong to a debtor and if necessary any goods that a debtor has a share or interest in. Whilst it is not the responsibility of the Enforcement Agent to determine ownership, the Enforcement Agent has a duty not to waste the court’s time and incur unnecessary litigation expense for the creditor. Two day course provides the underpinning knowledge to successfully gain the Level 2 qualification which is now required to obtain or renew your bailiff (enforcement agent) certificate. Course venues are Darlington, Stone (Staffordshire), and London (Waltham Forest). What can you do when commercial tenants break back into property after peaceful re-entry? Having owned the same stab vest for some years it was time to look around for a new product. I found a new generation of lightweight body armour from PPSS Group. This body armour is so much better than a stab vest for an enforcement agent. In the last few months we have seen a large increase in travellers occupying land around industrial buildings, and putting up section 6 notices stating they have the right to squat. It is a myth. We can and do evict them. Legally. I was asked recently to advise a client as to the best place to serve the notice of enforcement when dealing with Non Domestic Rates (NNDR) and Commercial Rent Arrears Recovery (CRAR). I allowed a friend to stay in my empty house, and now they are refusing to leave. What can I do to evict them? Helping a friend can be a serious problem, as this lady found out to her cost. The Law Commission is recommending to the MOJ, Ministry of Justice, that forfeiture should be only done by way of issuing proceedings, and the right to peaceably re-enter be abolished. The rights of Landlords have already been curtailed with CRAR. This proposal will seriously weaken rent enforcement in the commercial property sector if this becomes law. When is an Enforcement Agency not an Enforcement Agency? A commercial rent debtor gets a notice of enforcement through the post. Is the notice legal? A cautionary tale for solicitors instructing certificated enforcement agents. Read When is an Enforcement agency not an Enforcement agency? Can you forfeit the lease, take back our property, and seize the tenants goods? No is the answer to the question. Dependent upon circumstances we can do one or the other, but not both. Once a lease has been forfeited it is not possible to use Commercial Rent Arrears Recovery (CRAR) to recover rent arrears. Read Can you forfeit the lease, take back our property, and seize the tenants goods? Nine months on from the launch of The Certificated Enforcement Agents Association (CEAA) in December 2014, the Association launches its website and opens for members. The Certificated Enforcement Agents Association (CEAA) was formally launched during a meeting near Cambridge last Monday (8 December, 2014). Andy Coates of Quality Bailiffs is Vice President of this new Association formed by and for the Enforcement sector. Over recent weeks our company has been dealing with a group of travellers who are terrorising businesses in London and the South of England. The travellers park on the car park of commercial premises and demand money to leave. On 1 October 2015, the Insolvency Act 1986 (Amendment) Order 2015 increased the threshold debt needed for creditors’ bankruptcy petitions from £750 to £5,000. This has had a significant impact for collection of debts under £5,000. Enforcement Bailiff’s trials door-step visits, and has had good results for creditors. In the last three weeks Enforcement Bailiffs has been contacted by twelve businesses from different parts of the country that have been or have been about to be scammed by people purporting to be bailiffs. Know what to look for so you are not conned into paying CCJs that do not exist. Are you instructing a bailiff or a broker? As a customer you want to instruct an experienced firm of Enforcement Agents (Bailiffs) with suitable industry knowledge to ensure your job is undertaken legally, professionally, effectively, efficiently and economically. Beware of firms advertising enforcement services that are acting as brokers, sub-contracting the work to enforcement agents. Read Are you instructing a bailiff or a broker? Having been a bailiff for over 25 years I have been involved in some interesting cases but until this year I have never arrested a Ship. This year Enforcement Bailiffs has been involved in two. In the latest case we were able to arrest the ship early one morning before it left the dock and evaded paying the harbour fees.